Backpacking Background: I've been a backpacker on and off for over 25 years. I backpacked as a Boy Scout, and then again almost every month in my twenties, while packing an average weight of 50+ lbs (23+kg). In the last two years I have gained a renewed enthusiasm for the back country. I generally go on one or two night outings and now try to average a 30 lb (14 kg) pack. The Therm-a-Rest NeoAir is marketed as an ultra lightweight air mattress. It is part of the "Fast & Light" series produced by Cascade Designs. It has a 2.5 R-Value and is marketed to be three times warmer than other uninsulated pads. When rolled and stuffed in its sack, the NeoAir is nearly as compact as a one liter bottle. I read about the NeoAir in a magazine review that raved over the product. I've used a Therm-a-Rest Ultralite 3/4 pad or a REI Corelite pad for nearly a decade. The weight and packed size were what intrigued me about the product. Upon testing the NeoAir indoors it felt extremely thin and I was concerned about the durability. It took a great deal more effort than foam pads to inflate. It was like blowing up an inflatable for the pool. The bulk of my backpacking is done in the fall and winter, so I was concerned about R rating. With some concerns I stored the pad with the remainder of my gear. My initial field use was a three day, two night trip in Cherokee National Forest near Lake Watauga, Tennessee along the Appalachian Trail from 21 - 23 August 2009. The temperature during the day ranged from 75 F to 79 F (23 C - 26 C). We hiked the majority of each day, thus we didn't typically set camp until late afternoon. This removed the need to under inflate the pad as the manufacturer suggests when there is potential daytime warming. The first day of hiking consisted of an 1100 ft (335 m) climb and descent in less than one mile (1.61 km). After making camp and eating I was exhausted and made my way to bed. I was very careful to clear any twigs, pebbles or nuts from the area under my tent as I was still concerned about the NeoAir's durability. I laid on the pad and immediately noticed how how comfortable and stable I felt. The 2.5 in (6 cm) thickness and the horizontal baffles worked wonders. It was the first time in a decade that I slept completely through the night without stirring or rearranging in the woods. I had purchased the NeoAir for weight and storage savings, but after the initial night's test believed the comfort was without a doubt the key selling point to this pad. When I did uninflate the pad to stow it the next morning, it took very little time. I pushed the air out with an initial roll, unrolled and rolled the mattress once again. It disappeared in my older Therm-a-Rest Ultralite stuff sack. The second night we set camp right on Lake Watauga at 1959 ft (597 m), temperature conditions were similar to the first night. One of my backpacking buddies had a Therm-a-Rest Trail pad that he placed into a camp seat. I was and still would be concerned about doing this with the NeoAir as the materials are so thin, however, due to the terrain I had to set the tent and mattress up on numerous pebbles and small rocks, durability proved true. That evening a bear entered our camp, and had a torrential downpour not started, we may have never retreated to our tents. This evening adrenaline kept me from falling asleep quickly, but while laying awake for over an hour I again found the NeoAir a superbly comfortable rest pad. I had no noise issues with the pad. The NeoAir is not rated as a winter pad, but I wanted to test the limits of the pad. In October 2009 I had tested the pad at 36 F (2 C) and found it to be comfortable for me. I did notice that when I moved around during the night there was a coolness to the pad for a few minutes. At no time was I uncomfortable or cold. From 28 - 30 December 2009 I took the NeoAir on a true winter test on the Fiery Gizzard Trail in the South Cumberland State Park, Tennessee. The trail and campsites follow the rim of a gulf and are a fairly consistent 1720 ft (524 m). Daytime temperatures hovered around freezing and evening temperatures on night one dropped to 21 F (-6 C) and 24 F (-4 C) on the second night. My tent was my usual REI Quarter Dome T2, and my sleeping bag was a Montbell UL SS #1. It is rated at 15 F (-9 C). I also used a silk bag liner and a pair of silk long underwear. During the two night test I was never cold. In fact I was comfortable and warm. My backpacking buddy who was also using a NeoAir for the first time and using similar equipment stated he was also comfortable, but he would not use the pad if it was expected to be any colder than the conditions we were in. By this trip I had purchased the correct stuff sack and the correct repair kit. It disappears in my pack and the total weight with sack, repair kit and pad is 15 oz (425 g). Overall, I have been very impressed with the NeoAir. I purchased the sleeping pad with weight savings and smaller storage in mind. However, after using the pad in both warm and cold weather conditions I have found the comfort level is the best selling feature for me. Even at a 20% discount I found the pad costly, yet of all the lightweight gear I've acquired over the last year I consider this the best value. 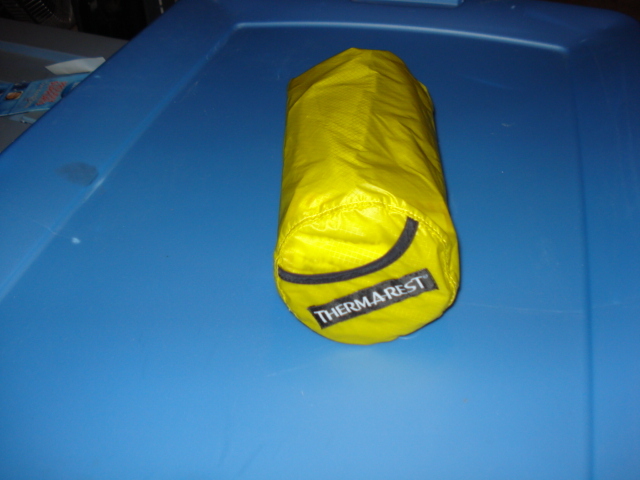 I would prefer that Therm-a-Rest included the stuff sack and repair kit, as many competitors do with their products. The pad does require the "Fast & Light" series repair kit. It only briefly mentions this in the instructions. I could not find the kit at any local outdoor retailers and had to order it online where shipping was at a premium. As with most new ultralight gear I would recommend taking extra gentle precautions in handling and using. After a half dozen nights in varying conditions I would certainly recommend this product. This report was created with the BackpackGearTest.org Report Writer Version 1.5 Copyright 2010. All rights reserved.